This case was designed for the University Of Nebraska's football video department. 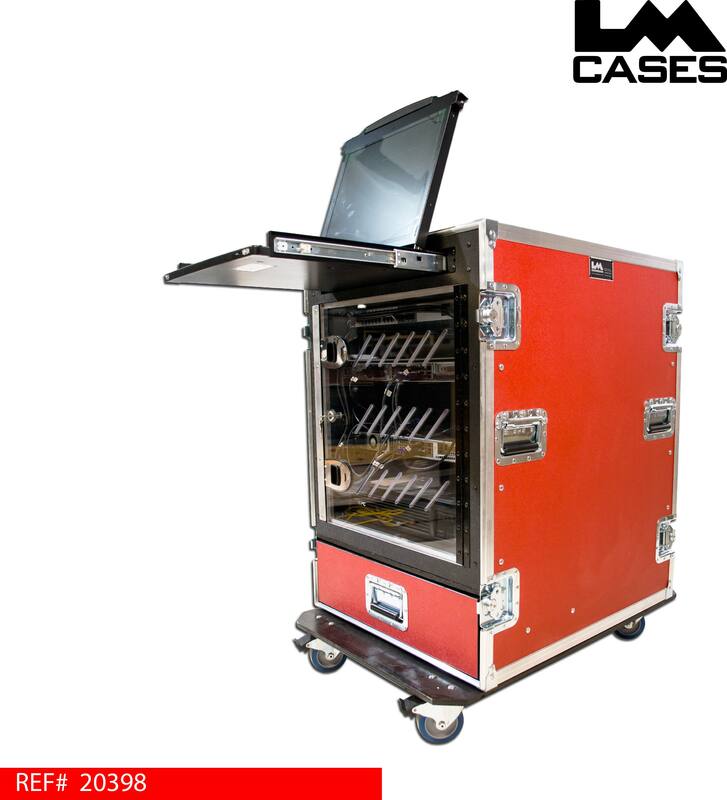 The case is designed to hold the departments video servers for road games. 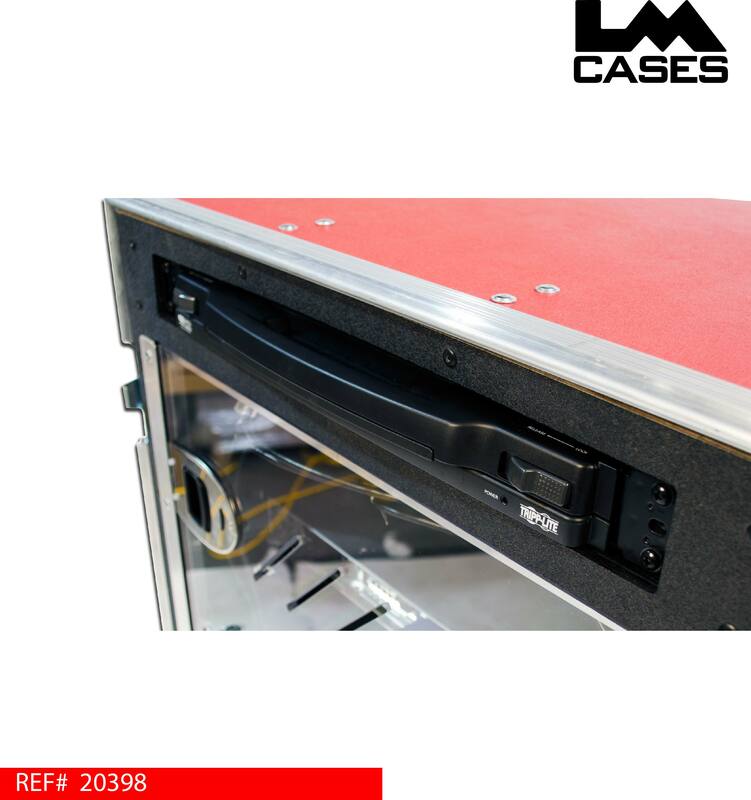 The servers are held in a 12 space shock mounted rack that feature vented 3/8" lockable Lexan doors on the front and rear of the rack shell. The doors are designed to allow users to see the status while not being able to tamper with them. 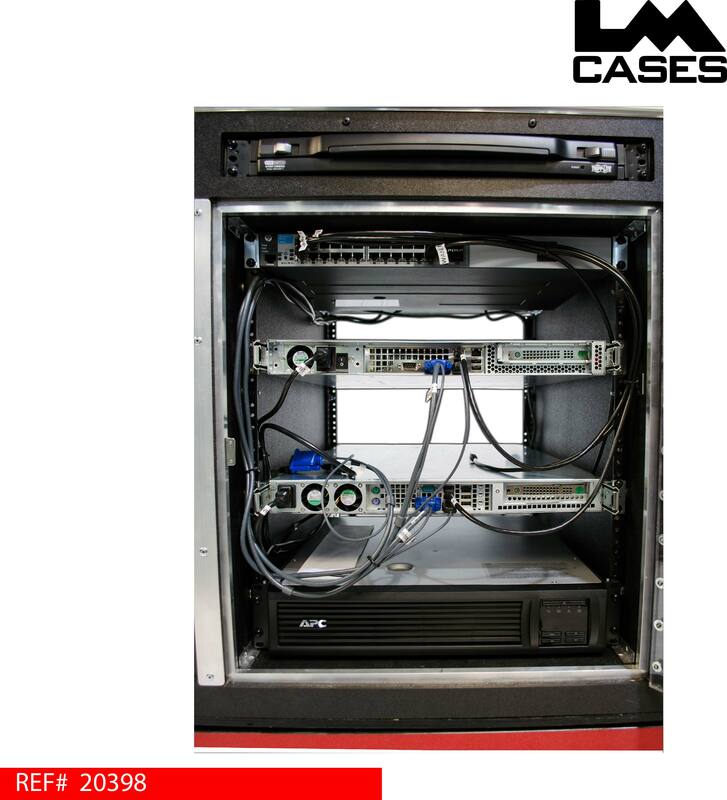 The servers are controlled via a Tripplite B020-008-17 KVM (keyboard/mouse/monitor) mounted above the rack section. 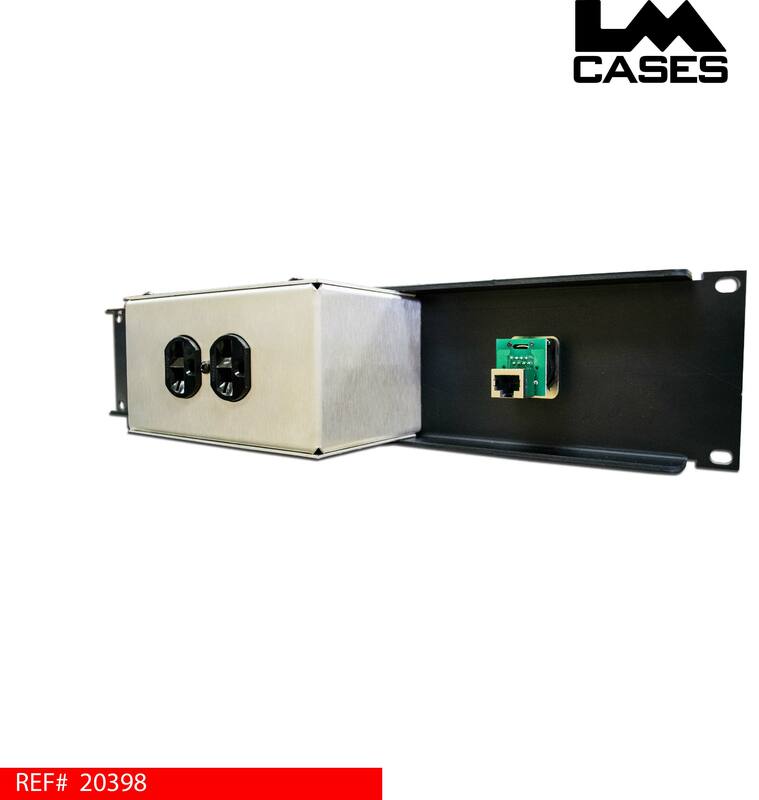 The LM Case Custom Integration department handled the mounting and wiring of the servers and components in addition to providing the Triplite B020-008-17 KVM, HP 2510G-24 switch and APC SMT1500RM2U UPS. 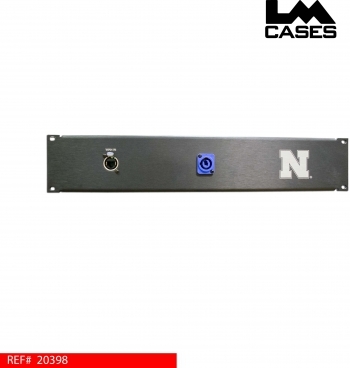 The CI department also provided the custom anodized 2RU panel featuring the school's "N" logo that holds the WAN input jack and a Neutrik Powercon connector. 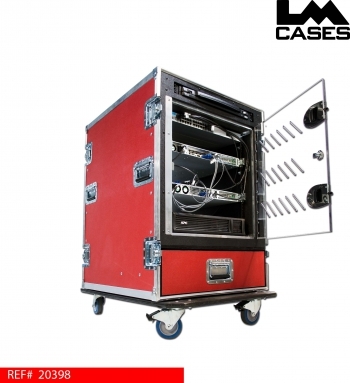 The custom panel allows the case to remain plugged in with the security doors locked. The case interior features a custom front and rear fascia that covers the internal workings of the rack shock mounting in addition to a storage drawer mounted on HD Accuride glide. The case exterior is built from 3/8" plywood and features deep recessed handles and 4" Colson casters. 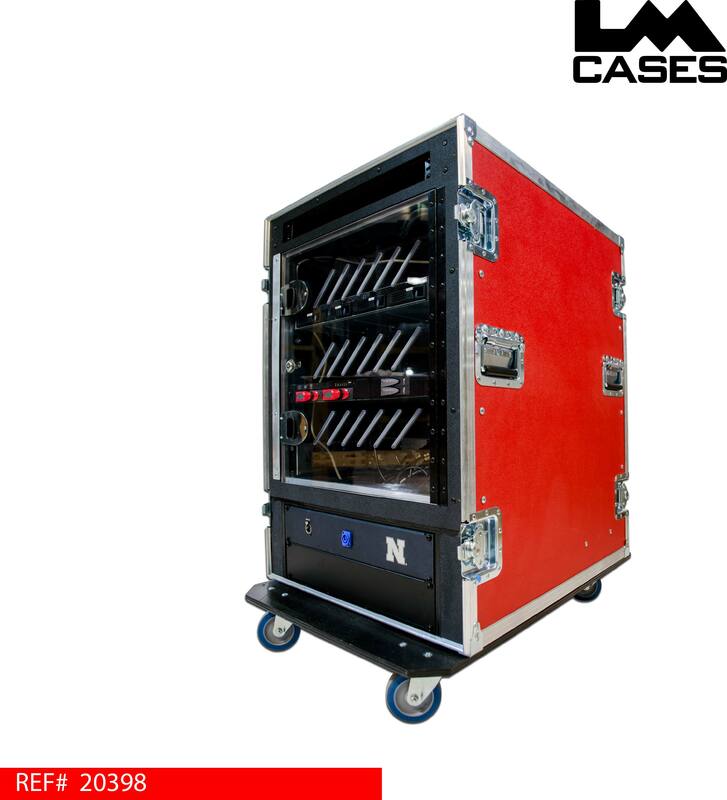 The LM Cases CI department worked with Nebraska's video department to design this case from the ground up. All transportation and use scenarios were discussed to ensure the case and the gear would stand up to heavy road use and provide reliable service for many years. As previously stated, the LM CI department handled the sale and installation of all the support equipment for the servers. All cables provided were labeled on each end and neatly dressed allowing simple connection and disconnection for routine maintenance. Special thanks to the University Of Nebraska Video Department for choosing LM Cases!